SCHEELS began as a small hardware and general merchandise store in 1902. Today, the company’s 27 stores in 12 states (with more on the way) offer the world's largest selection of sporting goods, sportswear and footwear. For the Fargo, North Dakota-based company’s first Colorado location, SCHEELS and its longtime architectural firm R.L. Engebretson were committed to providing natural lighting while protecting employees and customers from uncomfortable glare and heat. 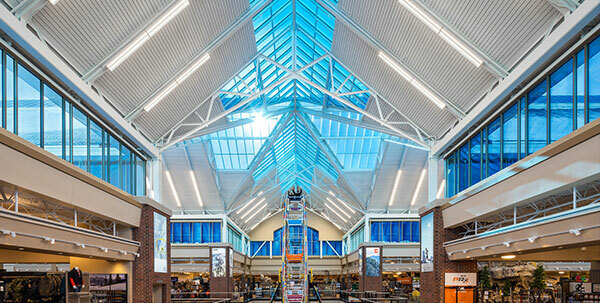 Dynamic glass proved to be the best option for maximizing daylighting, and the resulting building has since become one of the largest installations of dynamic SageGlass in the United States. “There are other retailers who seek to bring natural light into their stores, but not to the scale or magnitude that SCHEELS does,” says Rich Wiemken, Principal at R.L. Engebretson Architects. We spoke to Rich about his role in designing a superstore concept focused on natural light. Q: How long has your architectural firm designed buildings for SCHEELS? A: Rick Engebretson, our CEO, first began working with SCHEELS in 1994, and I have been working with SCHEELS from the time I joined the firm in 1998. We’ve worked on 25 SCHEELS stores, and we are currently designing new locations. Q: How has the architectural design of SCHEELS stores evolved? A: Most SCHEELS stores have some variation of a roof skylight with punched windows on the sides to access daylight. As the design developed over time, we found more ways to connect shoppers with the outdoors, such as using light shelves to bring natural light further into the interior. At the new Johnstown, Colorado SCHEELS superstore, we pursued natural light even further – designing a grand atrium and clerestories. Of course, it was great to get natural light into these stores, but at certain times of the day, in certain locations and at different times of the year, some shops would just be too bright. So, during the design process for the Johnstown SCHEELS, we started looking at our options. Q: What solar-control options did you consider before choosing SageGlass? A: We’ve done some smaller versions of stores that employ more traditional sun-control strategies. For the Johnstown SCHEELS superstore we looked into many different options. We considered motorized shades, but they didn’t have the functionality we wanted, and we found it cumbersome and costly to add a mechanical element that didn’t necessarily need to be there at all times throughout the day. We also looked at different types of glass and at different tints. We didn’t want tinted glass at all times. At night, you really want clear glass so everyone can see into the store and the atrium becomes a distinctive beacon. A group of us visited the Mall of America to see the SageGlass skylight there. Even though that skylight is smaller than what we planned to do at the Johnstown SCHEELS, we decided this product was going to be the right fit. Q: How did you use SageGlass in the Johnstown SCHEELS? A: Colorado has a lot of daylight hours and many clear-sky days with bright sunlight. Because we were doing a grand atrium, large skylight, curtain walls and clerestories in this location, SageGlass makes up almost every piece of exterior glass in the building. SageGlass was also used in the employee break room area that faces east. SageGlass gives the store a nice, clean look. It looks like a regular curtain wall or skylight until it changes its tint, and most people don’t even notice when it’s changing. To learn more about SageGlass in action, visit our portfolio page. SageGlass dynamically controls sunlight to optimize natural light, maintain outdoor views and enhance occupant comfort by preventing heat gain and glare. To learn more about SCHEELS, click here. Rich Wiemken is a registered architect. He controls the flow of design and turn-around as Principal and Director of Architecture at R.L. Engebretson. He works with clients and project team members through the design and construction process and supervises the entire architectural design team, including licensed architects, project managers, production staff, specifications writers and quality controllers.